Assessment of compliance of Italy’s fishing fleets and farms with management rules during the 2008 bluefin tuna fishing season in the Mediterranean. This WWF-commissioned report, researched and compiled by independent consultancy ATRT, contains the first in-depth analysis of the role of Italy in the bluefin tuna fishery in the Mediterranean. Its findings confirm the widely held view that Italy is among the main culprits in the region for overfishing and violation of the fishery’s management rules. In April 2008 WWF released a report quantifying for the first time the fishing overcapacity of industrial fleets targeting the stock in the Mediterranean . That study identified Italy as the leader in overcapacity among EU member states, with an estimated catch capacity for the industrial purse seine fleet twice the national quota allocated to it. The study pointed to the likely underreporting of real catches in the last years, coupled with a systematic violation of international management rules and the overshoot of national quotas. To ascertain the performance of the Italian bluefin tuna fishing industry during the crucial 2008 fishing season, the authors of this report have combined a thorough analysis of trade information with extensive field work. The latter has included the monitoring of Italy’s fleet at sea in real time, as well as the field analysis (through aerial surveys) of bluefin tuna biomass caged in every farm based in Italy, Croatia and Malta. This colossal undertaking has generated the most comprehensive picture yet of the role played by Italian interests in the Mediterranean bluefin tuna fishery, including the extent of compliance (or lack thereof) with international management rules agreed by the International Commission for the Conservation of Atlantic Tunas (ICCAT, the body tasked with sustainably managing the fishery) and the EU. 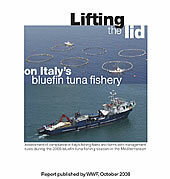 This WWF study is all the more relevant now, when the Italian government holds the view that the EU’s decision to close the purse seine fishery two weeks early (15 June 2008) resulted in the Italian purse seine fleet falling short of fulfilling its quota for the year (which even led Italian interests to the extreme step of taking the European Commission to the European Court of Justice). The current report reviews data for 2007 and demonstrates that Italy’s overshoot of the bluefin tuna national quota for 2007 amounted to a minimum of 1,653 tonnes, more than five times as much as the officially recognized overshoot of 327 tonnes. It also highlights the serious inconsistencies in the register of the fleet targeting bluefin tuna, with a broad mismatch of records between ICCAT, the EU and national fleet registers. Up to 163 purse seine vessels would have been active in the Mediterranean bluefin tuna fishery in 2008, according to the crosscheck between the relevant official registers. A total of 15 purse seine flotillas, or fishing groupings, were identified to be operating during the 2008 fishing season, including in partnership with other Libyan, Turkish and possibly Algerian vessels. The latter were identified as having been involved in an illegal operation of paper-quota transfer between Algerian and Turkish vessels during the 2008 fishing season. The report includes extensive field information proving that Italian airports have played a key role during 2008 as a hub for illegal aerial spotting activities in central Mediterranean waters. Additionally, Italian spotter planes have operated (with others, such as US, French and Swiss) in support of the illegal activities of Italian purse seiners. A total of 5 farms based in Italy were identified as active in 2008, containing an estimated biomass of 2,410 tonnes of live tuna (equivalent to an estimated weight at input of 2,241 tonnes). This tuna was caught exclusively by Italian purse seiners operating during the 2008 fishing season. Additionally, a conservative 1,321 tonnes of bluefin tuna is estimated to have been caught by Italian purse seiners in the early spring fishery inside the Adriatic Sea, including an estimate of 853 tonnes that would have been caged in Croatian farms. Finally, a further 1,159 tonnes of tuna are estimated to have been caught by Italian seiners and transferred to farms in Malta and Tunisia during 2008. The estimate of the total bluefin tuna catch by Italian fleets during the 2008 fishing season contained in WWF’s report thus amounts to 4,887 tonnes at the very minimum. This highly conservative figure does not account for any estimate of catches by long line fleets outside of the Adriatic Sea, due to the impossibility of obtaining this information, and yet, entails a minimum quota overshoot by Italy of 724 tonnes. One wonders what the final catch of Italy’s bluefin tuna fleet might have been, had the EU not closed the purse seine fishery 15 days earlier than initially scheduled this year. Additionally, the report highlights that several relevant fishing ports for bluefin tuna in Italy, such as Pozzuoli, Vibo Valentia, Portopalo and Cetraro, are duly registered with ICCAT as landing ports for the species, but do not report any single bluefin tuna. In WWF’s opinion, the disturbing findings of this report (concerning a significant EU member state) reinforce the conclusions contained in the recent independent verdict on ICCAT’s performance elaborated by an international panel of experts , released in September 2008. The report commissioned by ICCAT describes mismanagement in the East Atlantic and Mediterranean bluefin tuna fishery as an “international disgrace” and recommends that ICCAT immediately suspend fishing – until conditions for sustainable fisheries management exist. WWF continues to advocate a moratorium of the fishery – and in parallel encourages retailers, chefs, restaurants and consumers to join the growing boycott of the species – until Mediterranean bluefin tuna has been pulled safely back from the brink.